Last week I had a chance to do some more research in Santa Fe, continuing what I started a few weeks ago. The more I do, the more loose ends I find. I had learned that Miguela Bottger died in 1936 in Santa Fe and was buried in Rosario Cemetery. According to her obituary in the Santa Fe New Mexican, Miguela lived with her daughter on East Manhattan Avenue in Santa Fe. However, the 1936-37 Santa Fe City Directory showed that Julia and George lived on Acequia Madre Street and that George was a salesman at Bell’s Store. Most likely, they rented houses at a couple of different places in Santa Fe before returning to Albuquerque after Miguela’s death to live in the Bottger Mansion (thereafter called the “Gallegos House”). Except for the year 1936 when Miguela lived with her daughter, Julia Bottger Gallegos, and Julia’s husband George, all of the Bottger family lived in Albuquerque. I’ve always felt that cemeteries create a feeling of closure, especially if you’ve been looking for someone and find their final resting place. I wanted to find Miguela Bottger’s grave at Rosario Cemetery, take a photograph, and have an ending to her story, even though there are still gaps to be filled in. The man working in the office at Rosario was very nice and provided copies of the ledger books he had. One was a fee book, in which there was one entry for “Miguela Bottge” (name spelled incorrectly—again) on March 2,1936, for “opening and closing grave.” The other was a locator book, in which she was listed without an actual location. However, other people buried around the same time were listed either in family plots or in Section B. The more the man looked, the more he thought that she was buried in the “single grave” section (Section B), especially when I noted that the rest of the family lived in Albuquerque, and Miguela only lived in Santa Fe for a year or so with her daughter. A map of the cemetery showed that Section B was in the “old” section, much like the Santa Barbara section of Mt. 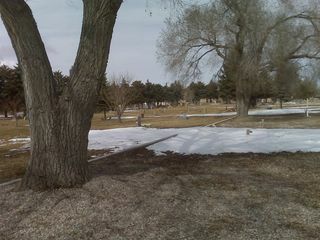 Calvary Cemetery in Albuquerque. And, like Santa Barbara, a large number of the graves were either unmarked or the headstones or markers have crumbled or been vandalized. He had told me that the row where she was most likely buried was in more or less chronological order. I found the earlier beginning of the row, with some grave markers from 1932 and 1933, and then there was a large bare space with no markers, covered with snow and ice. Farther down were additional tombstones from 1936 and 1937. No Miguela. But if she’s there, a very large tree shades her grave. The next time I return to Santa Fe, I’ll visit Rosario Cemetery and stroll down by the big tree, just in case there’s a small marker with her name on it. Otherwise, she will lie in restful anonymity over the passage of time, just like her relatives in Santa Barbara. two days of research at the New Mexico Archives and Records Center — Miguela Bottger maiden name mystery solved?